Not seeing your favorite in the case? In order to ensure freshness, all of our homemade candies are made in small batches. Fudge and carmel are made often weekly, but divinity might be made only 4 times per season. Marshmallow is somewhere in between that. We do try to keep everything in stock, but sometimes something will sell out before we get the opportunity to replenish our supply. If you have your heart set on something and you're visiting from far away, let us know before you visit so we can try to have your favorites on hand. With that in mind, please enjoy your C Shop candy within a reasonable time. We don't use preservatives so they will ultimately experience decline. If you want to know how long a particular candy will keep, just ask. There are also some tricks to extend shelf life if you want to save something longer over the winter. Just let us know. Have an idea that you'd like to try? Within reason, we can accommodate special orders. We can easily make a variety of barks or molded candy bars with interesting fillings for your special occasion. Do keep in mind that we're not very interested in using other commercial candies or various breakfast cereals to concoct combinations. We also cannot use your ingredients in our kitchens. Our most popular wedding favor is our delicate Daisy Mint which can be easily matched to your wedding color scheme. We also have thousands of other molds, so feel free to let your imagination run wild and let us help you make your special day even more special with C Shop chocolate. Please call Patricia at 360-371-2070 for details. All of our homemade candies are made from simple ingredients. We always start with pure cane sugar, sometimes butter, a small amount of corn syrup (not HFCS), and cream or nuts or chocolate or all of the above. They're made in small batches and include two precious ingredients you'll never find in commercial candy: time and love. Take a moment and chat with Georgia or Keith as they stir the copper kettle and you'll soon understand the passion and care they bring to their work. 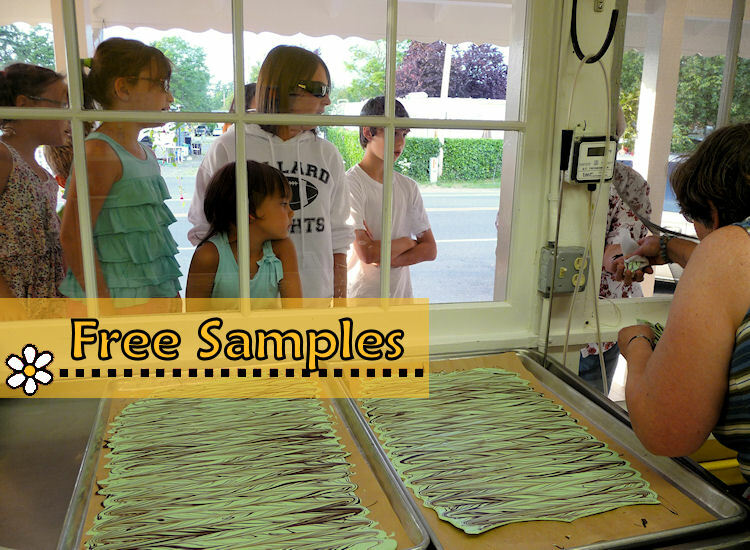 They make all the fudge, carmel, peanut brittle, seafoam, marshmallows, and so much more. Patricia or Molly can often be found dipping Peanut Butter Yumms, making bark, and assembling C-creatures. Everyone makes popcorn and cheesecorn, wraps fudge, and cuts Dreams and Nightmares. When candy is being made, there's sampling to be done. Naturally, we feel it's important to include our customers in the quality control process! We have a few things that we do exceedingly well and one of those is carmel. Yes, the spelling is intentional. 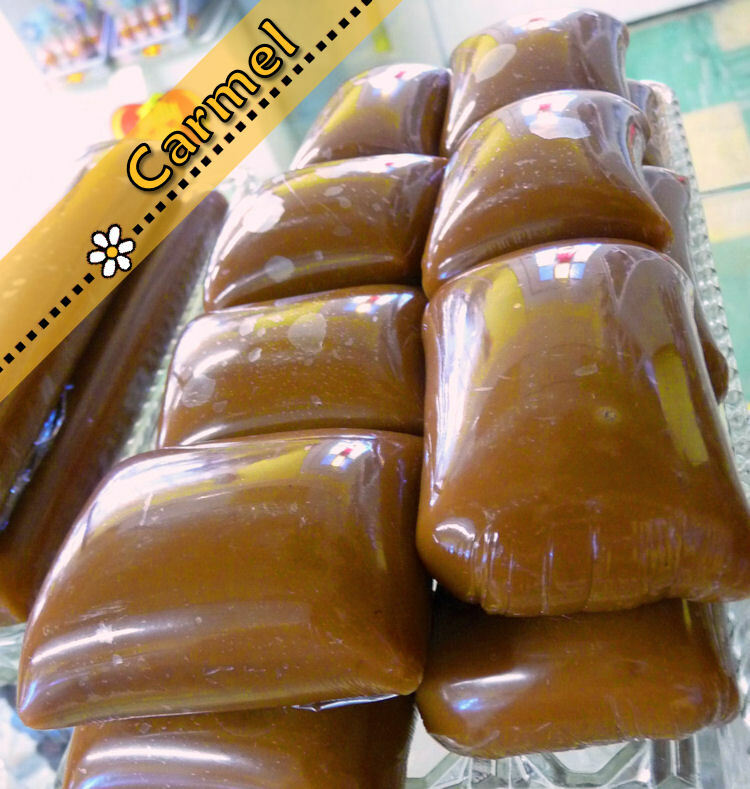 Our carmel is so much better than so many of the caramels out there that Patricia felt it deserved its own spelling. Our recipe is no secret, in fact it's been published many times, and it's simply butter, sugar, a touch of corn syrup, and cream. Well, that and two hours of stirring over a hot candy stove. Carmel can be purchased plain, chocolate-dipped, salted, salt and peppered, as Peanut Butter Carmel Rolls, DOMs, Dreams, Nightmares, and Carmellows. You'll also find it in our Ooey Gooey Bars, Crispy Goo Bars, Top Hats, Pecan Logs and various C-Creatures. Whew! 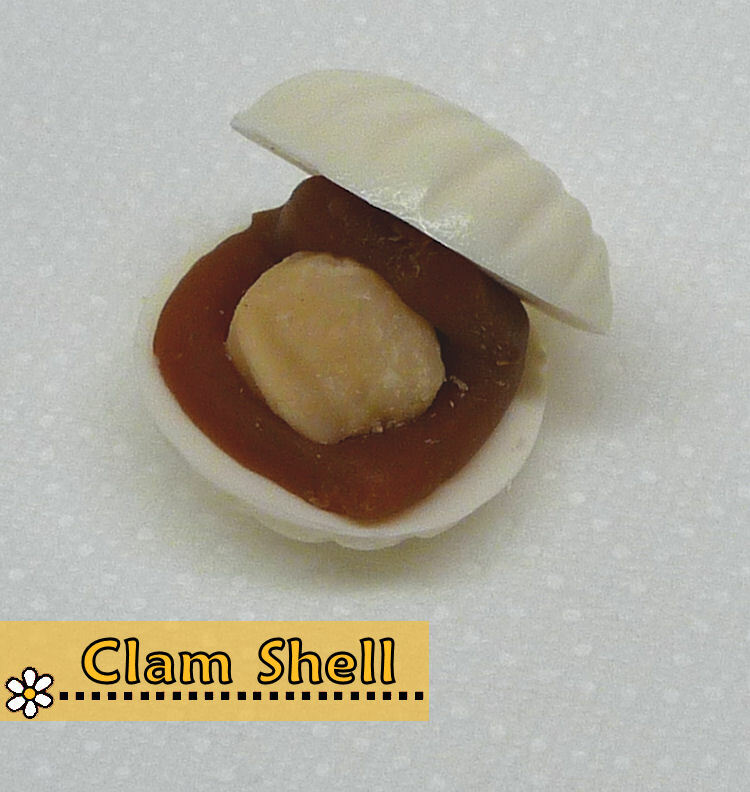 Oh and I almost forgot our cute little clamshells. 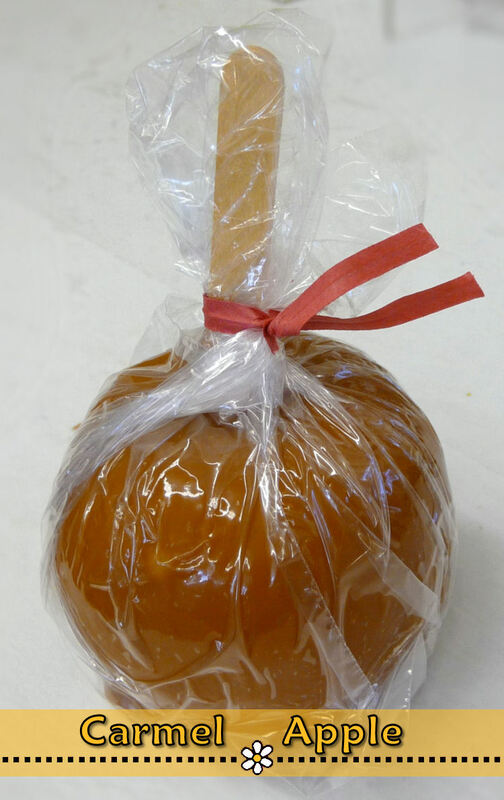 Another way to enjoy our carmel is on our carmel apples! That is particularly lovely since it's really a nice healthy serving of fruit, right? 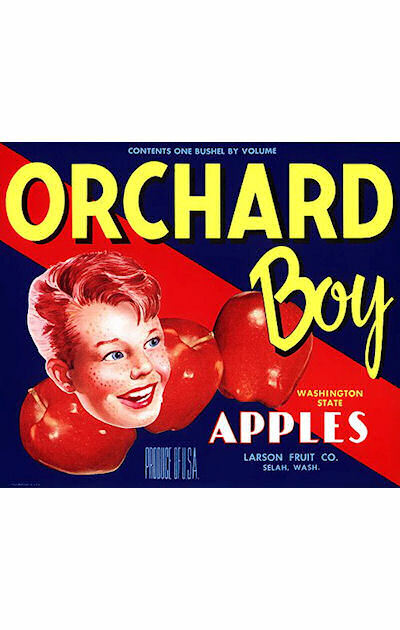 We always use Granny Smith apples from Washington. They are wonderfully tart and crisp to pair well with our sweet soft carmel. Some of you may think that the giant caramel apples available elsewhere are a better deal, but bigger is not always better. These are sized to provide you with the right apple-to-carmel ratio for the best carmel apple eating experience. Hey, it's our job to think about this stuff and we do. We also always guarantee the apples to be crisp and fresh. If one disappoints, bring it right back and we'll give you a new one. No questions asked.